The CD7 antigen is a membrane-embedded glycoprotein with a molecular weight of 40 kDa. It is expressed at an early stage of T lineage ontogeny, during the extrathymic prothymocytic formation. 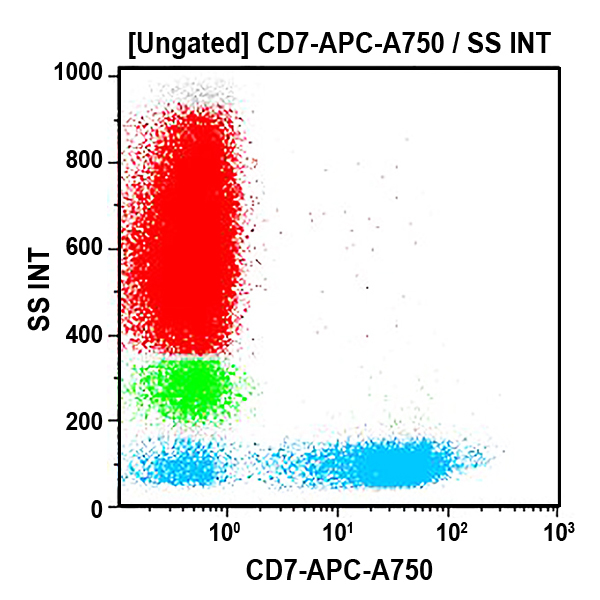 CD7 expression persists throughout T lymphocytes differentiation defining CD7 as a pan-T marker. It is also expressed on thymocytes, on the majority of resting T lymphocytes, and Natural Killer cells (NK), and on a subset of pre-B lymphocytes and B lymphocytes from foetal bone marrow. CD7 expression is also detected on pluripotent hematopoietic stem cells. Mature B-lymphocytes, cells from erythroid, myeloid and megacaryocytic lineage do not express the CD7 molecule. The CD7 molecule is involved in T lymphocytes activation. Its expression may be quantitatively up-regulated on stimulated T lymphocytes. *Alexa Fluor and Pacific Blue are registered trademarks of Molecular Probes, Inc.